BALDWIN PARK, Calif. /California Newswire/ — Laidlaw's Harley Demos are a popular and exciting way for riders to experience first-hand, the power and performance of a Harley-Davidson(R) motorcycle. On June 14 and 15 2013 the Corporate Harley-Davidson factory demo truck rolls into town and sets up shop at Laidlaw's Harley-Davidson allowing riders to experience the exhilaration for themselves by twisting the throttle on one of the new 2013 models. "The team at Laidlaw's Harley couldn't be more excited to offer the corporate Harley-Davidson factory demo fleet experience exclusively to Baldwin Park and Los Angeles! We welcome all riders to test the newest models in our Harley-Davidson line up. From stripped down Dark Custom bikes to our premium Touring models, we'll have a selection of the best Harley-Davidson has to offer," said General Manager Richard Litchfield of Laidlaw's Harley-Davidson. "If you've never experienced a Harley-Davidson or have been thinking for a while about that upgrade, this is your opportunity and it's completely free of charge, just show up with your motorcycle license!" Laidlaw's Harley will be hosting great activities for riders and non-riders. For those interested in learning how to ride, we encourage you to try our "JUMPSTART." This stationary motorcycle allows aspiring riders to learn how to start, shift and twist the throttle on a fully-functioning motorcycle that does not move. No motorcycle license required! Due to the demand from riders, since 2008, Harley-Davidson Motor Company has tripled its fleet of motorcycles offered for dealer demo events. In addition, on a daily basis Laidlaw's Harley offers individual test ride opportunities. We offer test rides for all licensed riders during the riding season. For more information on the upcoming demo event, please visit http://www.laidlawsharley.com/ . 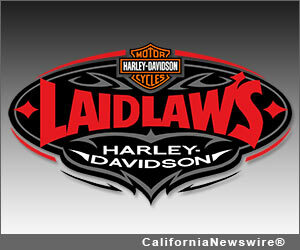 Laidlaw's Harley-Davidson – Baldwin Park and Los Angeles, California; 1919 Puente Avenue, Baldwin Park, CA 91706. Phone: (626) 851-0412. Toll Free Phone: (877) 437-3685.